It’s sketch challenge time again, with the Paper Craft Crew! It has been so wonderful, seeing all of the cards that you’ve created and added to our challenges. I just love visiting everyone’s blogs, and reading how they decided on which stamp set to use, or colour choices. We all have something that prompts us, one way or another, it seems. There’s lots of room for creativity with this sketch, don’t you think? Will you use designer paper, or will you create your own using background stamps? What theme will your card be – birthday, Easter, everyday? Of course, this little chick is also perfectly timed for Spring, as well! I haven’t gotten nearly enough use out of this Free Sale-A-Bration set, Honeycomb Happiness, as I want to, so it’s time to put it to use! Once I decided on using the English Garden Designer Series Paper, I pulled the rest of the colours from it, and it was smooth sailing! My card base is Melon Mambo, with a panel of Blushing Bride cardstock that I had embossed using the retired Spring Flowers embossing folder (the Fluttering EF with the butterflies would look cute, too). I then added a small rectangle of Night of Navy cardstock on top to the right, then added the English Garden DSP on top of that, cut to shape according to the sketch. I attached it using Stampin’ Dimensionals. Next I used the Ovals Framelits and die cut 1 oval from Melon Mambo cardstock, and then next size down in Whisper White. I stamped the chick in Archival Basic Black ink onto the white oval, then stamped it again onto a piece of the Free Sale-A-Bration DSP Perfectly Artistic. This was the perfect colour, complete with shading, for the chick, without me having to colour it! 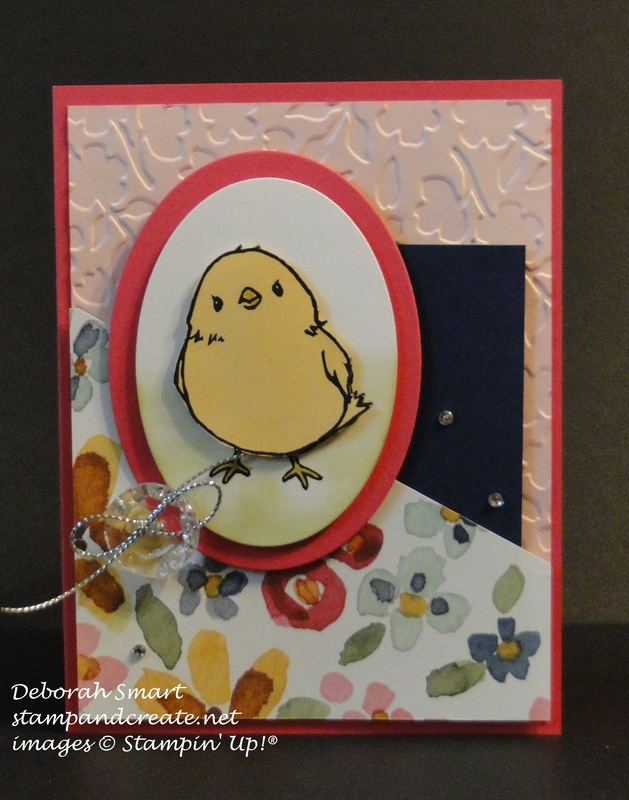 I simply used the Hello Honey Stampin’ Write Marker to colour in the feet and beak on both chicks, then hand cut the chick from the DSP. I didn’t cut out the feet; I just simply popped up the hand cut chick on top of the one stamped on the white oval. Done! Well, it was done after I added some sponging in Old Olive using a Sponge Dauber. I layered the 2 ovals together with Stampin’ Dimensionals, then attached them to the card front. I laced some Silver Cording Trim through a Vintage Faceted Button, tied a bow, and used a couple of Glue Dots to attach it to the card. A few scattered Rhinestone Basic Jewels, and my card was done! I can add my sentiment to the inside, once I decide which one I want to use. I hope you enjoyed seeing my card, and reading about how I pulled it together; I’d love to read any comments or questions you’d like to leave for me! Then I hope you’ll head over to the Paper Craft Crew page, have a look at what the rest of the Design Team have put together for your inspiration, and then of course – create your own card, and link it up for the challenge! Did you know – you don’t have to have a blog to join the challenges? Nope! You can link your challenge to any public page, such as your Facebook page, your Splitcoaststampers page, your Flicker account page – any place where we, the design team, can go and look, and leave a comment for you!